Balding is a process which in most cases does not occur overnight. It might start when in High School or University, although it can begin as late as the 40s and 50s. There are extreme cases in which a medical condition or medications will cause hair loss, but for the sake of this article we will focus on Male Pattern Baldness and the gradual process of thinning hair or a receding and mature hairline. It’s a condition that all men fear but with the proper care and education can be remedied in numerous ways. How does the Hair Loss process begin and at what age? As we have stated, the process can begin anywhere from the late teens to middle age. It is a genetic trait which inflicts individuals of all races and ethnicities, while seemingly affecting family members at random. My father started losing his hair in his early twenties and his older brother who is now in his early 80’s still has a full head of hair. My two brothers and I still have full heads of hair in our early 50s (knock on wood!). Put aside that Old Wives’ Tale that you might have heard and just deal with your own hair issue. The process can start as a receding hairline around the temples, thinning of the hair on the head, or specific areas of the scalp which commonly occur on the crown and top of the head. It rarely begins at the sides or the back of the head although it can occur. Because the sides and back usually retain the most hairs, these regions are used as the donor areas in Hair Transplants. Hairline changes and finding hair in the sink and shower are usually the first signs of the process. The average person loses about 100 hairs a day, so don’t be alarmed if you do find some in these locations. If the there seems to be more and more hair being found, then there is a chance that hair loss is occurring. It will take some scanning and help from a friend, but you will start being preoccupied every morning. In some cases, it can be demoralizing, but you are not alone and there are wonderful solutions. Once you realize that you are now one of the many victims, you will start to ask questions and look for solutions. Where do most men begin to find solutions for Hair Loss? Up until a few decades ago, before the advent of the Internet, men were left either speaking with their peers and their doctors, as well as scanning the back of magazines looking for that Silver Bullet. With the advent of the Internet, all the information that you might need is at your fingertips. This can be somewhat of a double-edged sword as for all the factual sites with important information, there are those which claim tremendous falsehoods in the search for making money. Whatever you decide to pursue, always consult your physician and remember, there are still no Silver Bullets for hair loss. For most men, the initial product or focus for their hair loss problem is a natural solution. Many men, and rightly so, are not ready to make a big decision in haste and would rather see if there can be a natural alternative. There is a world of information on this as you will want to separate the total bull crap from legitimate solutions. These natural treatments come in the form of vitamins, herbs, plants, foods, and can be taken orally or applied as lotions, sprays, shampoos and others. Many will also provide specific diets and certain changes in your lifestyle for healthy living. All these solutions can range from the inexpensive to the very pricey. You can go to your local natural health food store or market and pick these up on the cheap or order “cure all” solutions, creams and sprays over the Internet. In most cases the claims made for these products and solutions are not scientifically proven, and do not go through the rigorous approval process that medications go through. The claims are mostly conjecture based and must be taken with a grain of salt. The side effects are minimal, and the products can be purchased online or locally. Before you dive into these treatments be sure to check with your doctor as there can be side effects to those with specific medical conditions. The next step for most men who find the natural route disappointing will be more product based and include devices such as the derma roller, which has been used for other skin issues by women. Dermatologists claim that using this product at home can be dangerous and recommend not a “do it yourself” solution. This is just one solution available among a grab bag of products available online. A quick visit to Amazon can provide an abundance of these devices, ranging from the usual combs and derma rollers to the very unusual, such as Capillus Pro Mobile Laser Therapy Cap for a whopping $2,999.00. Some of the cheaper products are the Laser comb, Laser band, Hands Free LED Laser Light, Hair Growth Comb, and a ton of other products. 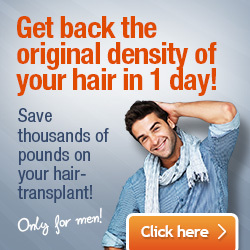 Its quit fascinating the number of devices that are “proven” to stimulate and regrow hair. Along with the devices are all kinds of topical solutions which are a “must have” if you want to maximize the growth. As these are not supplements, foods, lotions and creams, they are a whole new category of products. As noted in the Laser Therapy Cap, these items can be very expensive, and as a matter of facts cost as much as a Hair Transplant, which we will discuss later in the article. Like the Derma Roller, these products should be used with caution as they can damage the skin and body. Also, there is not too much scientific data to back up the claims, so it sounds too good to be true, it probably is. After more money paid for ineffective devices and more time passing, most men start to realize that there is no quick fix and that only scientifically proven solutions should be investigated. It’s a difficult spill to swallow, especially with the questionable testimonials and reviews, but you probably know by this point more about hair loss then many of the “experts”. Both Propecia/Proscar and Rogaine have up until 2018 been the only two proven drugs to be effective in hair loss. These two drugs, which are now available in generic form, have been proven time and time again as solutions to slow and stop hair loss as well as the ability to regrow hair. They be taken orally and as a topical lotion and in some countries can be bought over the counter without a doctor’s prescription. Even if you are allowed to by these products without a prescription, it is highly recommended that you consult with your physician before using these products. The side effects for you, and in the case of Propecia for pregnant women, can be serious, so be sure that you take any health issues into consideration. One of the benefits of these drugs is that the process is gradual and won’t change your appearance overnight. No one will know that you are taking these medications and if they do work, it will be a natural process. Taking this into consideration, you must also be patient and let the drugs do their work. You might experience shedding, and the hair might not start growing for several months, so don’t be too quick to judge it effectiveness. If these products are the solution to your hair loss, then congratulations! Nothing is guaranteed, but if you find Minoxidil or Finasteride have proven results, then continue with the treatments. These products are affordable as they are now in generic form and can be bought over the Internet. Just be sure you are buying the products from a reputable seller. Once you start taking the products and start seeing results, then unfortunately you must continue with the treatment. The one big problem with these medications is that if you are seeing results and then decide to stop the treatment, all gains will be lost. It’s a lifelong commitment until something more permanent comes along. If you keep it in perspective you can view this as continual treatment for an illness or disease in which you must take medication to keep under control. It’s a bit of a small price to pay for having your hair. For medical or personal reason, many men would rather not take any drug, unless their lives are at risk. Any prescribed or over the counter medication has its side effects, and many men are not willing to take a chance. There are also those who don’t respond to the drugs and after about 6-8 months, decide to stop the treatment. There are many factors which go into this, but for some, it’s a dead-end street. 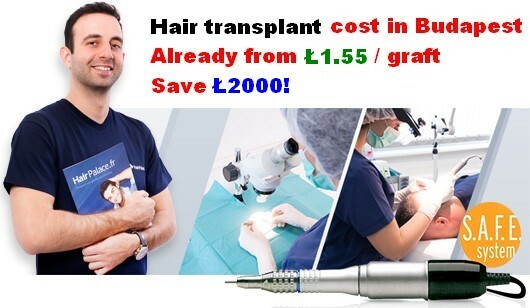 Some men might give up at this point, but there is a better solution to all those mentioned above, and most believe it is the most natural and permanent solution: This of course is a Hair Transplant, which in some iteration, has been around for about 50 years. Thankfully the procedure has improved with the times and technology, while offering a natural and scar free head of hair. Part of the reason for the natural result is the FUE procedure or Follicular Unit Extraction. This allows individual hairs to be extracted from the donor area and placed in the balding area. It has revolutionized the industry and created a safe and effective way to combat hair loss. The most recent update is the FUE Safe System which provides more donor hairs to grow in the implanted area. The Safe System can only be used by doctors who have been certified on the specific technology and instrument. For many young men who have reached this point in their search, it might seem futile. Those who are just starting out in their careers or who are starting a family might feel that a transplant is too costly. They might decide to put it off until they are more liquid and can pay the high cost of surgery. But there are two things which must be taken into consideration when making these decisions. First, the sooner you have hair transplant surgery, the chances for a successful procedure increase. The younger you are the more hair you have to donate, as well as the body’s ability to recover and heal. This significantly improves the success of the implanted hairs and creates a more natural look. Its basic physiology that the younger you are, the more apt your body is to recover from any kind of trauma, such as transplant surgery. Second, although the cost of the procedure can reach around $20,000 in most countries, there are affordable alternatives which can save you around 70%. Whether you’re in the US, UK, Canada, Australia and Western Europe, the cost will be in the area 20,000 $, €, and £. The alternative option is to fly to Hungary which in the past few decades has become the Medical Tourism capital of the world. The cost of surgery, including accommodations and transfers will come in at around $3,500 – $4,500. The other major cost will be the airfare (roundtrip/return) which in Europe and the UK will be about 200 Pounds or Euros, while a flight from the US will be around $1,000. Currently there are 3 direct flights from the US which include Philadelphia, New York and Chicago as well as direct flights from all major UK and European cities. The best part is that you will not have to sacrifice cost for quality. Budapest has some of the best private clinics in the world, and since Hungary is a member of the European Union, all clinics, hospital and doctors are EU certified. One only needs to read the reviews and view the video testimonials of the patients. No man wants to lose his hair, especially at a young age, but there are options and plenty of information to get started. We all suffer from our own male vanity and it’s only a matter of time before most of us start the hair loss process. When it does you will be happy to know that you are in good company of all your fellow brothers with great alternatives.